If you’re a JACL member, you most likely received your annual Pacific Citizen holiday issue a few weeks ago. It may not have had as many pages as previous holiday issues, but it looked pretty darn good and, more importantly, it was published. Is that a big deal? In a word, yes. I’d even venture to say that given the disarray that hit the paper over the last few months, having the holiday issue get published was an incredible accomplishment. Kudos, therefore, are needed for P.C.’s staff, namely business manager Susan Yokoyama, and interim executive editor Allison Haramoto. With their leadership and guidance, the necessary advertising and editorial duties were taken care of in a supercompressed time frame. If you read and enjoyed the P.C.’s holiday issue, know that only happened because they put in the time, got the additional help and willed the paper into existence. A bit of background. Back in August in this space, I wrote about how I was contacted by Gil Asakawa and Carol Kawamoto (the former and current P.C. board chairs, respectively) about helping out on an interim basis the paper where I got my start in print journalism a generation ago. They asked because in June, the former longtime editor, Caroline Aoyagi-Stom, resigned to leave for a new job. This was followed by the departure of the assistant editor, Lynda Lin, who left for mostly family-related reasons. The paper’s part-time office manager was also leaving. The only regular staffers left were reporter Nalea Ko and long-time circulation manager Eva Lau-Ting. They did the best they could, but they simply could not on their own put out the Pacific Citizen. Suddenly, the stability that had kept the P.C. on time and on schedule over the past few years was gone, and with it, lots of institutional memory and little things like website passwords. Unlike Dickens, it was the worst of times and the “worster” of times! I’m only half-kidding when I say that Gil, who pre-P.C. I knew in Colorado, and Carol, with whom I was acquainted from when I was at P.C. in the late 1980s and early 1990s, must have been really desperate if they needed my help! I agreed to help out and over a few weeks of summer, I helped produce three issues of the paper in what little free time I had outside of my full-time job. But with my kids’ school year looming and other obligations a higher priority, I needed to hand off the baton to others who could serve as editor. I knew of three candidates right off the bat with Japanese American community newspaper experience who could have, had they wanted to, taken the job. Queries to that effect proved fruitless; none were ultimately interested in becoming executive editor of Pacific Citizen. If J.A. community journalism is a peculiar beast, the ins and outs of the JACL’s paper are even more peculiar. I’m guessing they knew that the headaches and heartaches of working for P.C. weren’t what they were interested in at where they were in their respective lives. The business side was relatively easy to fill. I recommended Susan Yokoyama, a former Rafu staffer and my partner with NikkeiNation.net, to come in as business manager. She not only possessed the business, advertising and organizational skills necessary, she knew the community, lived locally and was ready to get back to a steady job, something that wasn’t possible previously because she was helping with ailing in-laws, not to mention being a mother and wife. Susan came on board and needless to say, she brought tenacity and a “get it done” attitude to the job. 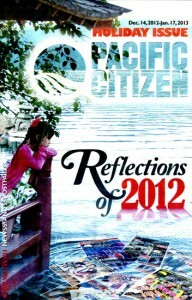 The holiday issue of Pacific Citizen, the national publication of the JACL. Allison left the paper in the mid-2000s; she and husband Nathan were already raising two boys; now their soon-to-be-born daughter was on the way. Then it hit me: Why not call Allison? Luckily, I still had a personal number for her. With her mom and one of her sons in tow, we met at the P.C.’s office. I told her as best I could of the challenges of the job under the best of circumstances; I also told her about the utter disarray that ensued with the departures of the former editors. Finally, I told her about the looming holiday issue, of how even under the best of circumstances (planning it out months in advance), it was a bear to produce. Ultimately, Allison agreed to serve as interim editor. She produced a few issues before the holiday issue and then, with help from many sources, she led the team to do the near impossible: completing the Pacific Citizen holiday issue. If you’re a JACL member and P.C. subscriber, you now know a bit of the back story about why you even received it this year. It could have been much, much worse. Here’s the thing that perplexes me, and goes to the heart of the aforementioned peculiarities of the Pacific Citizen. As of right now, Allison Haramoto is still the interim editor. From my perspective, she could have and should have been made the full-time permanent executive editor at the end of November. While that didn’t happen, she kept the paper going, learned what was necessary by producing weekly issues beginning in September, and managed to also publish the holiday issue, something that was truly in doubt. The former editor left in late June. It is now February. A decision that could have been made last year is supposed to be made this month at the JACL’s National Board meeting. I have no doubt that Allison should get the nod and be hired. After all, the delays are actually costing the Pacific Citizen money on a number of fronts. To my mind, there is no good reason why the necessary steps to finalize making Allison Haramoto the P.C.’s executive editor haven’t already happened. She’s proven herself and she wants to do it. But the dragging on of the ambiguity has to be a mental and emotional drain. It would be for anyone. After all, confirmations of U.S. Supreme Court justices have happened quicker than this! And we’re talking JACL here, not the highest levels of the federal government. While unlikely, there is the outside chance that further delays will ensue or that Allison could be passed over for the job for someone from out of town with no first-hand experience in either professional journalism or producing the P.C. After everything that Allison, Susan and the rest of the staff have done, were this to occur, it would doubtless mean the end of Pacific Citizen. It would also be a grievous wound to the JACL itself. They say that justice delayed is justice denied. The same could be said for any unreasonable delay in being hired for a job. We’ve all heard the stories of Nisei vets who proved they were up for serving under duress and showing their loyalty, then not being able to catch a taxi, get a haircut or ride a bus. Fortunately, redress happened and recognition came, if belatedly. Also, it was one thing when it was other people doing that to us in a less-enlightened time. What’s pathetic is when it is us emulating that sort of behavior towards ourselves. I completely agree that the hiring the Editor of Pacific Citizen is long over due. Not many articles have been written about Nikkei journalism. Nevertheless, there is curious fascination in the survival of the Pacific Citizen. Life is fleeting, newspaper are the only record easily available to most Nikkei people. The materials carried by Pacific Citizen has always been seen as being of significance not only for the day but even for posterity; news, pictures editorial viewpoints, reader’s opinion have been perceived to have had a longer validity than would be indicated by their appearance in a newspaper. Therefore we take for granted, much more sophisticated news and its presentations. It can be done; but we need a stable Editor. Let’s select this Editor and move the Pacific Citizen into the 21st century with vigor.